The module for simulation of X-ray scattering properties from the atomic level. The approach works only for finite systems, so that periodic boundary conditions and cell shape are ignored. \(q\) is a scattering vector length defined using scattering angle (\(\theta\)) and wavelength (\(\lambda\)) as \(q = 4\pi \cdot \sin(\theta)/\lambda\). The thermal vibration of atoms can be accounted by introduction of damping exponent factor (Debye-Waller factor) written as \(\exp(-B \cdot q^2 / 2)\). The angular dependency of geometrical and polarization factors are expressed as [Iwasa2007] \(\cos(\theta)/(1 + \alpha \cos^2(2\theta))\), where \(\alpha \approx 1\) if incident beam is not polarized. thermal damping parameter \(B\) – squared Angstrom (Å2). The resulted X-ray diffraction pattern shows (220) and (311) peaks at 20 and ~24 degrees respectively. The dependence of atomic form-factors from scattering vector is calculated based on coefficients given in waasmaier dictionary according [Waasmaier1995] if method of calculations is set to ‘Iwasa’. In other case, the atomic factor is equal to atomic number and angular damping factor is omitted. Class for calculation of XRD or SAXS patterns. atoms object for which calculation will be performed. X-ray wavelength in Angstrom. Used for XRD and to setup dumpings. thermal damping factor parameter (B-factor). method of calculation (damping and atomic factors affected). If set to ‘Iwasa’ than angular damping and q-dependence of atomic factors are used. For any other string there will be only thermal damping and constant atomic factors (\(f_a(q) = Z_a\)). 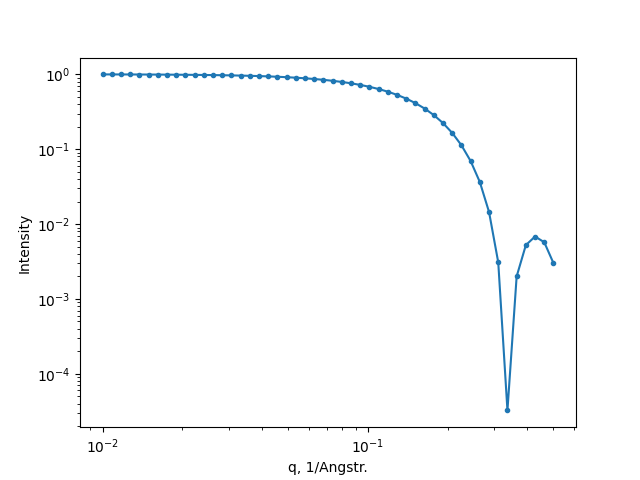 parameter for angular damping of scattering intensity. Close to 1.0 for unplorized beam. Calculate X-ray diffraction pattern or small angle X-ray scattering pattern. points where intensity will be calculated. XRD - 2theta values, in degrees; SAXS - q values in 1/A (\(q = 2 \pi \cdot s = 4 \pi \sin( \theta) / \lambda\)). If x is None then default values will be used. the mode of calculation: X-ray diffraction (XRD) or small-angle scattering (SAXS). list of intensities calculated for values given in x. Get the powder x-ray (XRD) scattering intensity using the Debye-Formula at single point. scattering vector value (\(s = q / 2\pi\)). Intensity at given scattering vector \(s\). Scattering factor for free atoms. for hydrogen will be returned zero value. 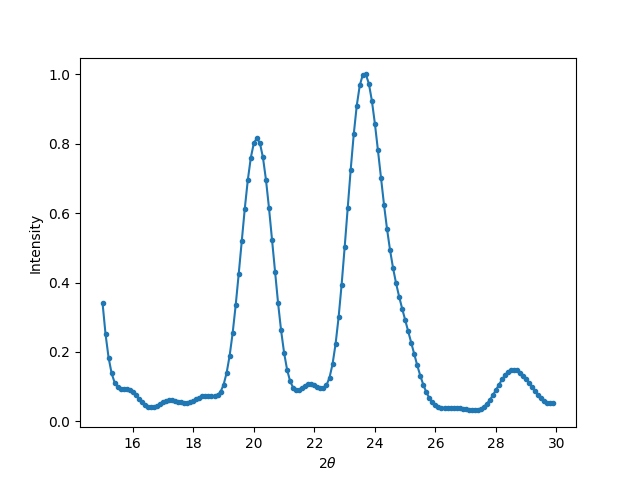 Uses Matplotlib to plot pattern. Use show=True to show the figure and filename=’abc.png’ or filename=’abc.eps’ to save the figure to a file. Save calculated data to file specified by filename string.